As they grapple with application backlogs and a shortage of seasoned, business-savvy developers, enterprises will increasingly look to drag-and-drop programming options. Any complex organization wants to move faster, increase efficiency and lower its costs. That’s never been easy. There are too many moving parts — spread across layers of heterogeneous, hybrid IT — and too much inadequate expertise to accomplish everything. I’ve never heard anyone say they ran out of applications to build before they ran out of good application developers to build them. It’s no wonder that the get-to-the-cloud message, with its push-button, pay-someone-else-to-manage-it vision has finally penetrated almost every organization. With the cloud-first mantra these days, the CIO might as well be thought of as the cloud information officer. However, in today’s highly internetworked, hybrid world, IaaS is no longer the big cloud opportunity. Where IT can help the business gain real competitive advantage is now up the stack with some form of PaaS model, such as high-productivity application PaaS. To be competitive, companies want to build and deploy new applications quickly. PaaS promises to enable developers to build better apps and deploy them faster without IT infrastructure friction, thereby unleashing pent-up productivity. 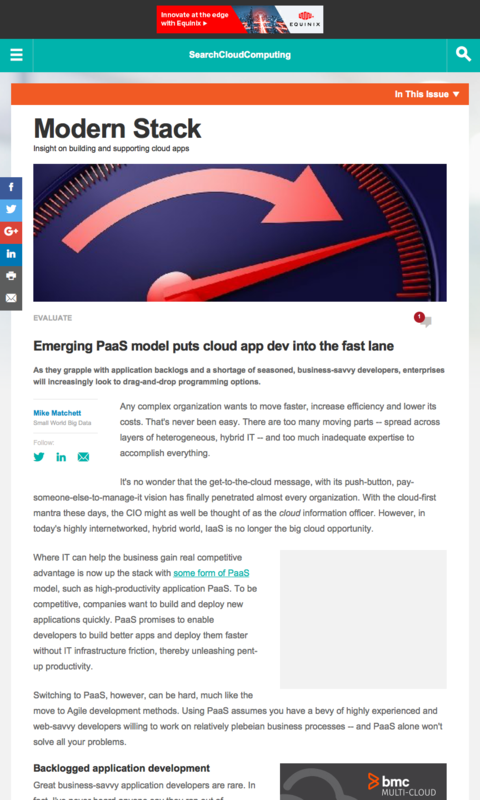 Switching to PaaS, however, can be hard, much like the move to Agile development methods. Using PaaS assumes you have a bevy of highly experienced and web-savvy developers willing to work on relatively plebeian business processes — and PaaS alone won’t solve all your problems. App dev bottleneck. How many people really grasp top-notch, web-scale coding practices and know the business? Among them, how many know about scalable databases, machine learning algorithms and also have the patience to provide internal customer support? Data swampiness. Some of today’s most valuable data is big, bulky, barely structured, increasingly real-time and growing. Put it all in a data lake and maybe you can make some use of it, but only if you can sort out what’s relevant, what’s compliant and what’s true. Even harder, most new apps will want to naturally span and combine both structured and unstructured data sources. Creativity cost. It takes a good idea and dedicated resources to make a great new business app work well. And it requires a culture that approves of investing in projects that might not always produce results. The biggest returns come from taking the biggest risks, which usually means more money on the line. Ticking time. Ask everyone within your organization for application ideas, and you’ll be sure to compile a huge backlog. Many of those applications are impractical for the simple reason that, by the time developers finish, the app’s window of competitive value will have disappeared. Who needs another outdated application? It’s hard enough to maintain the ones already in use. 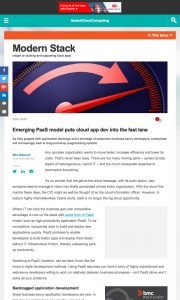 This entry was posted in Published Articles and tagged PaaS, Platform as a Service, SearchCloudComputing by Mike. Bookmark the permalink.